Retail Price: $374.95 ONLY: $329.95! The TCTW Transmission Teardown Workbench is great for engine, transmission, hydraulic system and rear end work, not to mention any other projects that involve dripping fluids. 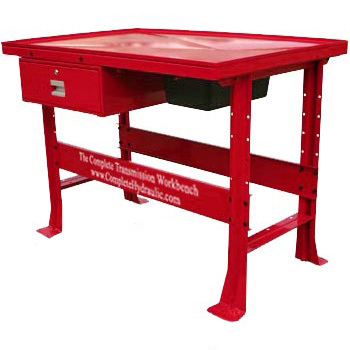 The steel table has a 32” x 47”-inch top and a ½” rim to contain liquids, which drain into a removable 11” x 16½” x 6½” polyethylene container. The table’s height is 41 inches. There’s even a heavy-duty 19½” x 20” x 5½” drawer that locks to protect your tools. The TCTW weight is just under 195 LBS. EACH. If you have any questions or would like more information on this equipment, PLEASE CALL US AT 1-888-736-5094!